The NXV-CPI is the ideal solution for organizations that have already invested in Cisco® IP Phones that would like to add basic control to a room. The NXV-CPI allows Cisco Phone users to minimize their investment in new infrastructure by transforming Cisco Phones into Modero® Virtual Touch Panels. Using the phone's built-in touch screen, users can access and control lights, shades and other AV equipment in the room. Dealers can use the NXV-CPI as a cost-effective entry point to control. 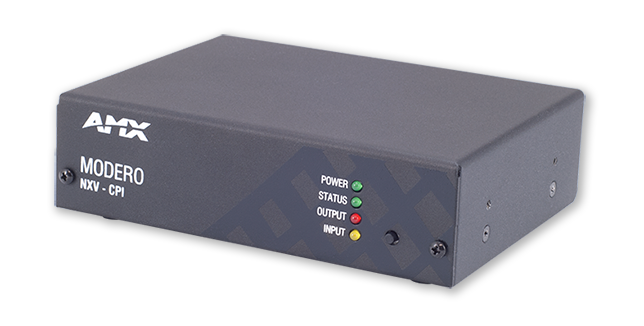 As control requirements grow, users can easily upgrade to an AMX Touch Panel. Setting up the system is easy. Simply browse to NXV-CPI's Web page, label the buttons and add the related NetLinx® control commands. NXV-CPI is compatible with Cisco models 7965G and 7975G. 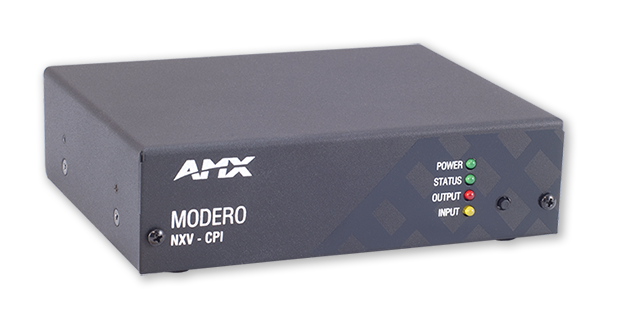 The NXV-CPI is ideal for entry level conference rooms who have already invested in Cisco IP phones that want to integrate AMX control into the room. Cost-Effective Control from an IP Phone – Control lights, shades and AV equipment right from two fully integrated phones. Control any Room 4 Ways – Touch the screen, push the hard buttons, use the soft keys, or the numeric keypad. Rear Panel Components LAN Port, LEDs: SPD (speed), L/A (link/activity). See Data Sheet for details.